Born an Okie from Muskogee on October 17th 1923 Barney Kessel was a self taught guitarist whose main influence was the legendary and tragic jazz guitarist Charlie Christian. After playing in local bands Barney relocated to Los Angeles where he freelanced for such great band leaders as Charlie Barnet, Artie Shaw, Les Brown and Benny Goodman, not a bad apprenticeship! AVID Entertainment presents a fully re-mastered Double CD on our AVID JAZZ imprint featuring our hero as leader of his own groups in the 1950s. We include his first four LPs in their entirety (minus one short track)  Easy Like, Plays Standards,  To Swing Or Not To Swing and  Music To Listen To Barney Kessel By. 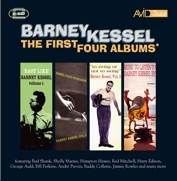 Supported by such fine award winning musicians as Shelly Manne, Bud Shank, Harry Eddison and Bill Perkins these four albums show us what a superb guitarist and arranger Barney Kessel really was! 4 What Is There To Say?